The City is reviewing existing standards for accessory dwelling units (ADU’s) with the goal of establishing a more uniform definition and set of requirements across Portland’s various zoning districts. The effort to standardize ADU terms and standards is a vital component of the ReCode process. An ADU is an additional living quarter that is independent of and wholly contained within a principal building or attached/detached accessory structure (such as a garage) on property where a single-family dwelling-unit or multi-family dwelling-unit is the principal use. ADU’s are equipped with kitchen and bathroom facilities and are typically subject to standards related to location of the ADU within a site, interface of entrances and ADU size. An ADU within a single family home is distinguished from a duplex, for example, because the ADU is intended to be clearly subordinate in scale and placement in relation to the primary residence. Why do Accessory Dwelling Units Matter? ADU’s have the potential to increase the city’s supply of affordable housing (both for rental and home ownership), augment the diversity of housing options available to Portland’s residents, provide flexibility for property owners, address shifting demographic trends towards smaller households, allow more possibilities for aging in place, and allow for the more efficient use of existing housing stock and infrastructure. ADUs can be utilized to provide living quarters for family members, such as aging parents or college students, as well as offering greater flexibility and independence to retirees by potentially allowing them to remain in their home and age in place. In short, ADUs are one important element of Portland’s approach to creating a well-rounded housing supply and an organic way to allow neighborhoods to retain their character as they grow. 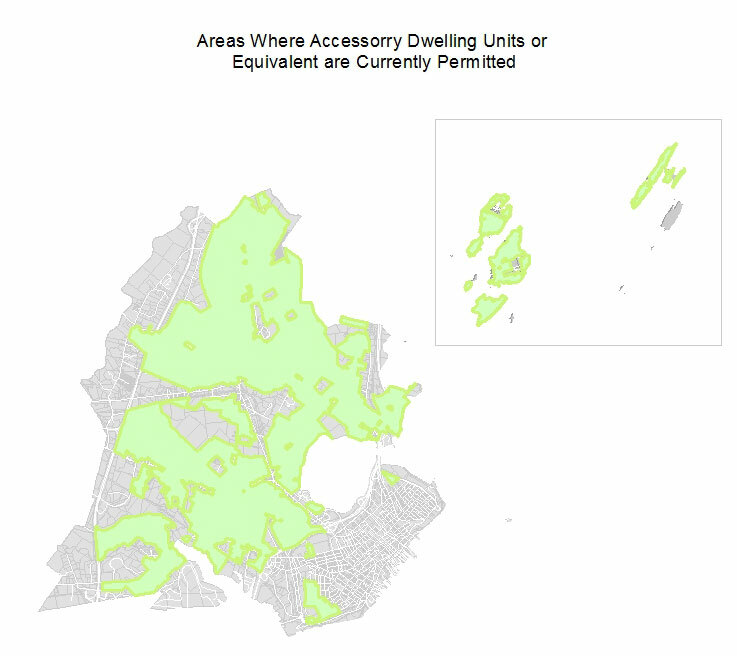 How does Portland currently REGULATE Accessory Dwelling Units? At present, some form of accessory dwelling unit is permitted within most of Portland’s residential zoning districts, with some exceptions. The terms used for this land use tool vary, and may be listed as either an accessory dwelling unit, such as in the R-1, R-2, R-3 and several island zones, or as an additional dwelling unit, such as in the R-5 zone. All zones consider this a Conditional Use, and standards, dimensions, and requirements vary. For example, the R-1, R-2 and R-3 permit ADU’s so long as the total floor area of the ADU does not exceed 30% of the total gross floor area of the property, whereas in the IR-1 and IR-2, ADU’s are limited to 35% of the total gross floor area. In all cases, as Conditional Uses, they are subject to additional standards and increased oversight by the Zoning Board of Appeals (ZBA). Portland allows accessory dwellings in many areas of the city, but there’s not yet a unified approach to them, and the current requirements may be more restrictive than they should be. This is a perfect opportunity to gather community input, conduct research on ADU best practices and comprehensively revisit this topic, with the goal of broadening opportunities for implementation, reducing unwanted regulatory constraints and employing consistent terminology. Watch this space for updates later this summer. Please send questions or comments about existing ADU standards or upcoming changes to recodeportland@portlandmaine.gov.